A much praised and highly sought after herb from Traditional Chinese Medicine with a wide range of potential therapeutic possibilities including longevity and as a performance enhancer. Cordyceps are said to be the secret weapons for the unexpected success of the Chinese atheletes in the 1996 Olympic games! A typical dosage range for cordyceps is 1 to 3 grams up to 3 times a day for antiaging, renal or hepatic support, as a chemoprotective or performance enhancer. Avoid in individuals with a known allergy or hypersensitivity to cordyceps, mold, or fungi. 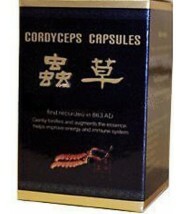 Cordyceps may cause dry mouth, nausea, loss of appetite, diarrhea or dizziness. Cordyceps is not recommended for pregnant or breastfeeding women due to a lack of available scientific evidence. Cordyceps may be possibly unsafe in pregnant women, as it may affect steroid hormone levels. See Using the herbs click here of this page. Please Note: that this information for legal purposes is general information about the plants traditional uses, and can not be related to any products Indigo Herbs have for sale.